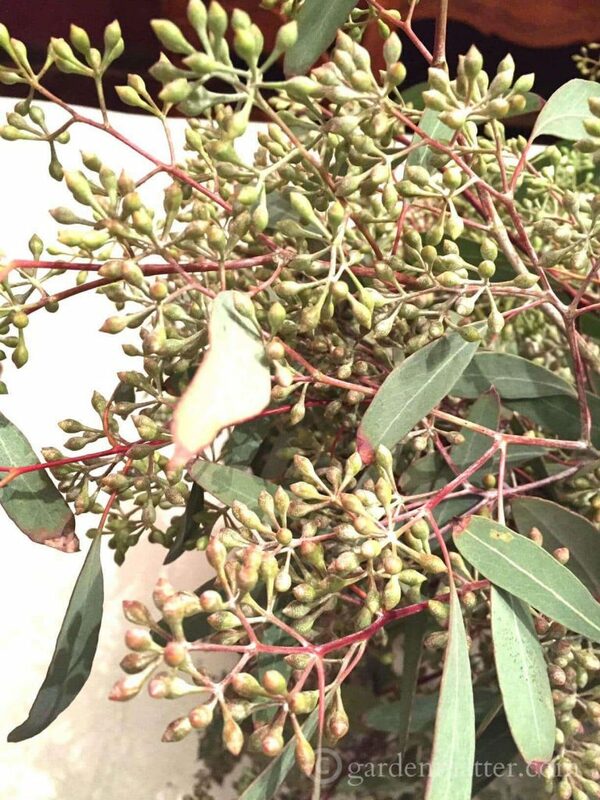 This tutorial for a seeded eucalyptus garland is easy to follow and can be used for a variety of fresh or dried plant materials. Did you know that you can easily make a garland from many types of plant material? I had some seeded eucalyptus from last year’s Christmas centerpiece, and now a whole year later it is so pretty I had to use it again. This tutorial for a seeded eucalyptus garland is easy to follow and can be created from a variety of fresh or dried plant materials. All you need is plant material and floral wire . I will tell you that the dried eucalyptus was a little brittle so I had to be careful. But you can use many fresh greens which may be growing around your home. You can also buy bunches from garden centers this time of year. Good choices are evergreens like pines, cedars, and boxwood. Here’s what the eucalyptus looked like fresh. I purchased it from a street vendor last year. I’ll probably buy some more if I have a chance because it smells wonderful and dries so pretty. The process is the same for whichever plant material you choose. Start with manageable lengths around 5 – 7 inches. Lay your first piece down on the table. Then lay the second piece slightly overlapping the first and attach with a paddle of wire, winding a few times until it is secure. Continue this process of laying pieces down on top of the last, covering about one-third to one half of the last piece to hide the wire and stems, and secure with the same paddle of wire. Before you wire the last piece turn it the opposite direction so the stem will not show on the completed garland. Hang for all to enjoy. I considered spray painting this garland with some glitter for added glitz but decided against it. However, I do think it could add a nice touch depending on the situation. The whole project took about 30 minutes. I don’t know if it will last forever but I’m happy with the way it turned out. After all, since I already had the materials on hand, the price was definitely right. Love this idea! I’m going to have to keep my eye out for some seeded eucalyptus now! I just picked up some more today. It’s so pretty and smells great. I hope you find some. You’ll love it! I love seeded eucalyptus, especially incorporated with pepper berries and plumosa fern. Your mantle is beautiful, glad you decided against the spray – the natural is so nice! Back in my floral days everything seemed to get a dash of glitter spray, it brought the color out. If they could create a spray like that without the glitter that would be awesome. I might have to hunt me down a bunch of this wonderful, thinking a wreath would be sweet. Thanks for the inspiration! You are so kind as always. I’m sure your a busy down south with a the many projects you have going on. A wreath would be so fabulous. I can almost smell it. I’m hoping to get me hands on some more this year when I go to the strip market with my sister and friend. That’s where we found it last year since sadly, this does not grow in PA. We have plenty of pine though, and it smells great too. You’re so kind – enjoy stopping by here, you’re one of my favorites! You can go to a floral shop and buy a bunch fresh. They can get it right off the truck I’m going to guess retail shouldn’t be more than $20 – course I’m basing this on years ago info. You probably know this but you can work with it when it’s fresh like in a wreath and it will dry in place. So you have it year after year. Looks also wonderful with heather mixed in, which will also dry naturally – just a tad brittle. I’ve been stuck indoors – raining here for day and I’m hoping for a break come Monday Afternoon!